A high school student, Panh Nha, and an old farmer, Thom, sit side-by-side on a park bench. They’re strangers, but they strike up a conversation about Panh Nha’s drawings of a superhero turtle. Thom remarks that everyone should be like the superhero turtle, and stand up for each other; Panh Nha admits that he would rather be more like his pet turtle, and remain in his shell. “How did the whole country allow itself to be pulled into the horror of the Khmer Rouge…do you think?” Thom asks. “I don’t know, but I think people should stop dwelling on the past,” replies Panh Nha, quickly changing the subject. 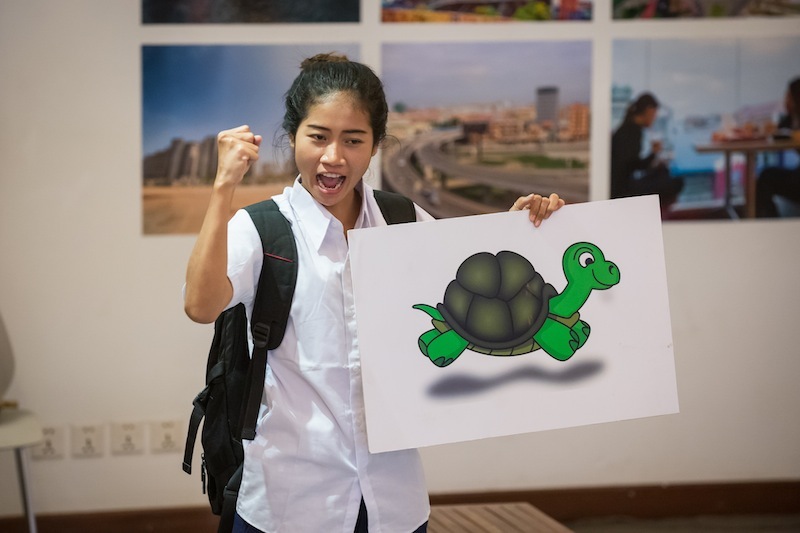 The student and the farmer are characters in “The Courageous Turtle,” a new educational play that seeks to teach young people about the Khmer Rouge regime. Funded by the German government, the play has been performed 64 times since November, and has proven so successful that the initiative is set to expand to classrooms and community centers nationwide this year. The project is being spearheaded by Nicolaus Mesterharm, founder of Phnom Penh’s Meta House cultural center. The German expatriate said he came up with the idea out of concern that young Cambodians did not know enough about the Khmer Rouge. “According to a Berkeley study from 2010, four out of five respondents—among those who had not lived under the Khmer Rouge regime—stated that their knowledge of the Khmer Rouge was poor or very poor,” he said in an interview earlier this month. Mr. Mesterharm said he had personally spoken with many Cambodian students who said they found the topic boring. “As a German national, raised in another post-genocide society, I found that quite strange, as I was educated about Nazi atrocities in school frequently—and as students, we felt it was crucial to understand about the past to build a better future,” he added. 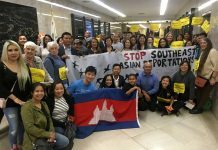 The situation reminded Mr. Mesterharm of an old Khmer expression, “Like a turtle in its shell,” which refers to acting cowardly or feigning ignorance in the face of injustice. He decided to stage a play based around the idea, recruiting playwright Sokyou Chea to flesh out the concept. Ms. Chea crafted a story in which a student, Panh Nha, rediscovers his family’s history after a chance encounter with a former Khmer Rouge soldier, Thom. Panh Nha then reimagines his timid pet turtle as a brave ninja, eventually realizing that this fictional hero is a reflection of who he wants to become. “Finally, he finds the courage to face and free himself from his fear, just like a turtle that can only make progress when it sticks its head out,” Ms. Chea explained in an email. Mr. Mesterharm said student feedback on the play—performed by young graduates of the drama program at the Royal University of Phnom Penh—has been overwhelmingly positive. “We hope this triggers an intergenerational dialogue, where kids start to ask questions and learn from the elders,” he said. Following the success of the first few months, local telecommunications firm Smart jumped on board to sponsor the project, and the increased funding will see an additional 60 schools participate, with the play expected to be performed more than 150 times across Phnom Penh and all 24 provinces this year. Tep Vanthon, a 58-year-old Khmer Rouge survivor from Kompong Chhnang province’s Rolea Ba’ier district, recently saw the play and welcomed the news that it would be staged more frequently in the coming months. “I’ve noticed young people are not well informed, and they are less interested in Khmer Rouge stories when their parents or relatives speak about them. But they enjoy watching the play,” she said.